The desk has two “scenes” which are level settings for 5 microphones; one scene on the Left and one on the Right. The engineer would fade from one pre-set scene to the other using the centre fade control. This allowed quick transitions between microphone setups, as linear controls (now called faders) were not yet common. Below each of the 5 level controls are on/off switches, with corresponding green and red lamps above to indicate the on/off setting for each input. 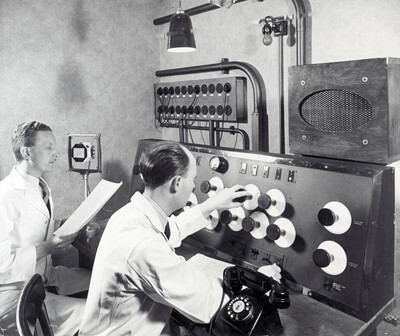 This photo shows the desk in use at Abbey Road in the 1940s, with staff engineers Laurie Bamber and Chick Fowler. This entry was posted in engineers, making a recording, PEOPLE, RECORDING EQUIPMENT, RECORDING STUDIOS, RECORDINGS, Uncategorized and tagged 1940s, abbey road studios, brain kehew, chick fowler, emi recording desk, emi recording studio, laurie bamber, staff by Nipper. Bookmark the permalink. Reblogged this on Dedicated to Queen's "fried chicken!". Well spotted…it will be corrected in the next few days .. but for the time being I hope your good at hand stands!!!! These are beautifully photographed… are they part of a private collection? There is some realy unique stuff in the rest of his photostream.